Inspirational messages for teachers: The teaching profession isn’t an easy one. It takes an undying passion to trudge through gloomy days made worse by brats, unruly students and a lot of the other downsides of being a teacher. These quotes are an awesome doze of motivation for teachers who are truly passionate about inspiring children and making the world a better place. Don’t wait for Teachers’ Day to show some appreciation for the folks who are working hard to create a brighter tomorrow. If you know someone who is a teacher, give them a reason to smile by sending a text, Facebook message or a tweet that brings out the best in them. 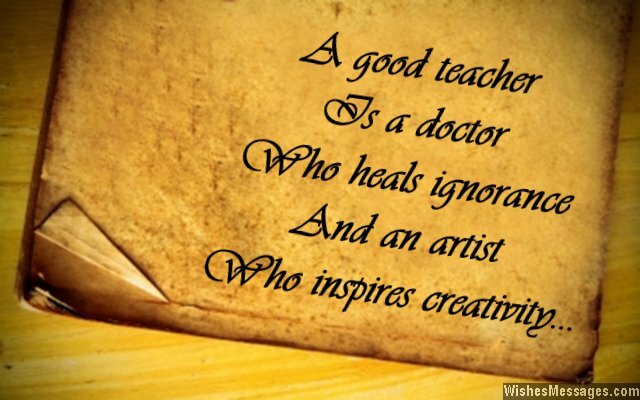 1) A good teacher is a doctor who heals ignorance and an artist who inspires creativity. 2) Ordinary teachers tell students what life is all about. Extraordinary teachers like you let students discover life on their own while watching over their backs. 3) Teachers – the link between knowledge and education. 4) The most wonderful part of being a teacher is to think that many years down the line, there will be someone, somewhere out there, thinking about how lucky they were to be taught by a teacher as wonderful as yourself. 5) Bad teachers teach to pay their bills. Good teachers teach because they are passionate about teaching. Great teachers like you, teach to make the world a better place. 6) Behind every successful man and woman, there is an unsung hero – a teacher who silently enjoys tears of happiness when she sees her students succeed. 7) There is nothing more inspirational that a teacher dreaming about being able to give flight to a child’s dreams. 8) Only the teachers who are truly passionate about teaching can make students truly passionate about learning. 9) Your job titles may be TEACHER but in reality you all are the ARCHITECT who is shaping humanity’s future. 10) A good teacher is one who has the knowledge of a scientist and the personality of a politician. 11) Teachers – the silent warriors who make the world a better place, one child at a time. 12) Don’t let the brats ruin your day. Think about how the good students will one day look back at their lives and be thankful for having such an awesome teacher like you. 13) Do you know why picking a gift for Teacher’s Day is the most difficult thing to do? Because it is hard to find a gift that comes anywhere close to the value of that a teacher adds in a child’s life. You are the priceless piece of the jigsaw puzzle of a child’s journey from being a curious kid to a responsible adult. 14) Teachers do what books can’t and what parents don’t. 15) The best part of being a teacher is that when your students grow up they will forget everything you taught them, but they will never forget YOU. 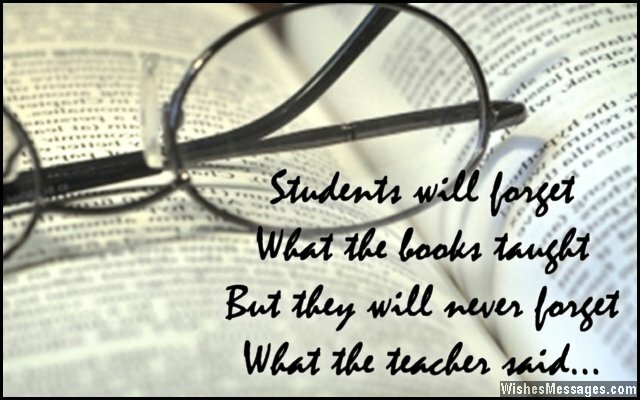 16) Students will forget what the books taught but they will never forget what the teacher said. 17) Teachers are the people who dedicate their entire lives in for just one cause – helping others build their own. 18) There is no need to read life stories of successful entrepreneurs to feel inspired. Just look at the life of a teacher whose life revolves around giving others a better one. 19) The difference between books and teachers is that books can teach a child the meaning of creativity but can’t do what teachers can – teach a child how to be creative. 20) A teacher is the gardener who sows the seeds of imagination today which will reap into the leaders and innovators of tomorrow. 21) The journey of every doctor, engineer, scientist, astronaut, programmer, architect, accountant, analyst and all other professions begins under the watchful eyes of the most important one of all – Teacher. 22) Teachers are torch bearers for mankind, carrying the light of knowledge and passing it from generation to generation. 23) A world without teachers is a world that doesn’t exist. 24) Even Superman is not as powerful as a good teacher. Superman has the power to fly but teachers have something so much greater – the power to make someone else’s dreams fly. 25) The most intriguing part of being a teacher is that you never know how you will eventually shape the lives of your students. For every student, you are shaping not only their lives, but the lives of their husbands, wives, children, grandchildren and every single person they interact with in the future. Just imagine, you have the power to affect so many lives. 26) The desire to be a good parent is organic. But the desire to be a good teacher is true sacrifice – it is the undying passion of trying to change the world one life at a time. 27) There isn’t a single good thing about being a bad teacher, just like how there isn’t a single bad thing about being a good one. 28) Bad teachers are the biggest enemies of mankind while good teachers are the biggest allies. So much so, each and every teacher has to power to inspire the next Steve Jobs. 29) A high school teacher – the most hated personality in the school corridors, but the most adored one in minds of the same students when they grow up. 30) Steve Jobs, Barack Obama, Bill Gates, Mark Zuckerberg and Hillary Clinton come from different walks of life but they all have one thing in common – teachers who inspired them to be the visionaries that they are today. 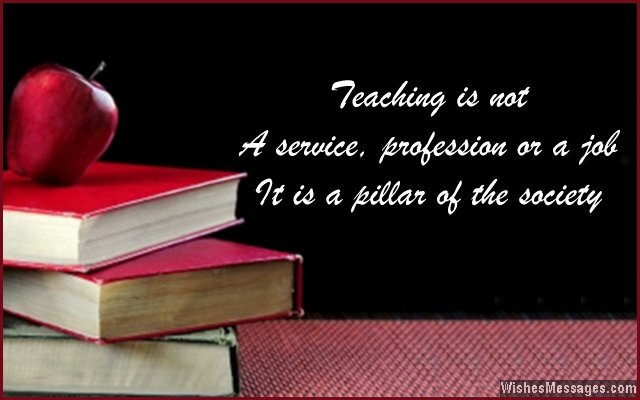 31) Teaching is not a service, profession or a job – it is a pillar of the society. 32) Of all human beings, teachers are immortals because their words stay in the minds of their students for the rest of their adult lives. 33) Even the best teachers never get the respect that they truly deserve. But they seek solace in knowing that even the best students never learn to give their teachers respect until it is too late. 34) Being a teacher is such a selfless profession. Teachers spend their lives teaching children how to eventually live lives without their guidance. 35) You have the chance to become that favorite teacher who someone will fondly remember decades down the line.